The Malaysian Global Innovation and Creativity Centre (MaGIC) has selected 27 start-ups for the second cohort of its Global Accelerator Programme (GAP), which aims to help global start-ups to be investment-ready in four months. This is in a bid to build a strong start-up community in ASEAN. Among the list of Malaysian start-ups selected for GAP include gift platform Camdy, e-commerce platform Cantikful, automated trading platform Dagang Algomecs and health beverage brand Heal Nutrition, among others. GAP will help equip each start-up with the necessary skills, knowledge, and network to become investment-ready in four months, and potentially break into the Southeast Asian market shortly afterwards. This year, GAP has been expanded to cater to start-ups looking to find growth by entering new markets, offering greater value creation for start-ups and the opportunity to build a strong network with corporates and investors. The greater focus on access to capital, through working more closely with venture capitalists and integrating them into GAP, will expose startups to more opportunities for real investment and overcome the big hurdle to growth of raising capital. The programme provides four months of mentoring from technical and business experts; direct access to route-to-market partners such as Google, Malaysia Airlines, Maybank and Media Prima; a six-month professional visitor pass for those not based in Malaysia; access to a co-working space; accommodation for the duration of the programme; as well as benefits worth over USD500,000 from Amazon Web Services, Canva, iPay88, EasyParcel, HubSpot and Kakitangan, among others. Government agency partners for GAP are Cradle, MyCreative Ventures, Malaysia Venture Capital Management, National Innovation Agency Malaysia and the Malaysia Digital Economy Corporation. 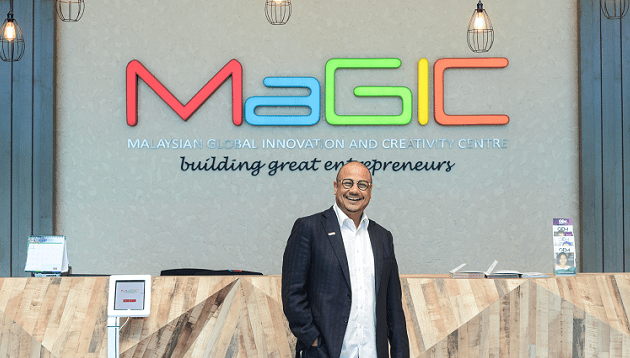 According to CEO Ashran Dato’ Ghazi (pictured), MaGIC believes it is important to not only add capital into the market, but also place focus and emphasis to ensure entrepreneurs truly get access to investments. This is currently a missing link within Malaysia’s entrepreneurship ecosystem and one MaGIC is actively working to help bridge, he said. “Looking beyond the direct benefits entrepreneurs take from the programme in the form of upskilling their teams, mentorship and access to route-to-market partners GAP also helps aspiring entrepreneurs, or those looking to take their venture to the next level, to connect with global entrepreneurs, share learnings and different viewpoints as well as explore expansion opportunities in Southeast Asia. This is helpful for Malaysia’s businesses as they work to better position themselves and create the mindset shift required to remain relevant in the fourth industrial revolution and achieve success in the future,” he added. Last month, The Star reported that MaGIC is one of the government agencies that Prime Minister Mahathir Mohamad plans to shut down, along with reviewing various mega projects by the previous government. CEO Ashran Dato’ Ghazi said that it is “business as usual” for the agency and it remains committed and focused on its work for the entrepreneurs. “On behalf of the MaGIC family, I would like to thank you for all the support that the community have given us in light of this confusion. Its been very heartwarming. Thank you again,” he said. MaGIC’s spokesperson also told A+M then that it is “watching the situation closely” and will keep everyone updated when new information becomes available. SCA Hygiene has engaged CRM specialist agency On-Target to assist with loyalty marketing activities for its Drypers' Happy Family ..
Changing brand and agency roles are negatively impacting the customer experience and marketing’s ability to demonstrate tangible b..
Local boutique PR Consultancy firm Intelectasia has bagged Sime Darby Healthcare's one-year long PR retainer contract following a .. The new campaign "Dare to shine" is the first cross-border collaboration between Lancôme and Airbnb, to promote Lancôme’s UV exper..